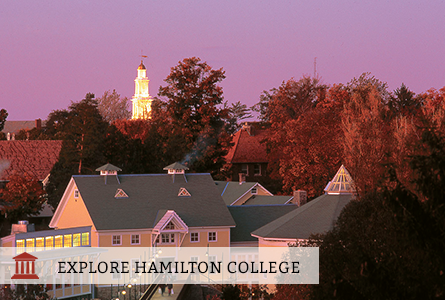 Hamilton College, located in Clinton, New York, is the third oldest college in New York State. It occupies a 1,350-acre hilltop campus and is within a 4-5 hour drive of New York, Boston, Philadelphia, and Toronto. Hamilton is a national leader for teaching students to write effectively, think for themselves, and learn from each other. The College’s open curriculum differentiates Hamilton from most other liberal arts colleges, because you will work closely with a faculty advisor to craft an individualized plan of study tailored to your interests and goals. Within your academic program, you can pursue a multitude of opportunities such as studying abroad, conducting independent research, or participating in an internship to explore a career interest. Generous funding is available from the College for summer research and internships. The College’s tight-knit community is welcoming and diverse. Hamilton brings people together from different backgrounds, perspectives, and interests, making the campus an incredibly engaging place to study and live. Outside of the classroom, students can choose to participate from among 1,200 concerts, lectures, workshops, debates, sporting events, or volunteer activities hosted each year. The campus is also a short distance from Utica, a major resettlement community for refugees, and Syracuse, which provide students with opportunities to explore the rich variety of ethnic, cultural, and volunteer opportunities in the region. Fun fact: The College is named for Alexander Hamilton. While he is a bit of a Broadway celebrity these days, due to the wildly successful musical based on his life, he has always been the College’s favorite founding father.